Print on paper is a practical, attractive, and sustainable communications medium. Our business works because we use as few resources as we can. Fewer resources equal less waste. We simply couldn't afford to offer you such low prices if we were wasteful or inefficient. That's why we reward our Production Hub team for reducing waste and we pay bonuses to anyone in our family who has an idea on how we can work more efficiently. Any unavoidable waste paper is compacted and recycled and we separate all other waste into seventeen distinct streams for recycling or reprocessing. We use vegetable-based inks, pumped straight from large drums, rather than smaller cartridges in wasteful packaging. Our printing plates are recycled and used chemicals are disposed of responsibly. We’ve switched all our matt and gloss laminated print to a new biodegradable film. This “bio” film looks like regular lamination and feels lovely. When the print reaches the end of its useful life, it composts. Within two years it’s gone. Without leaving contaminants in the soil. As a leading manufacturer of print and promotional items, we understand our duty to operate to the highest levels of quality whilst respecting the environment. 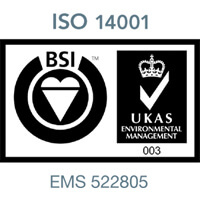 Our Environmental Management System has been assessed by BSI and we’re certified for ISO 14001, the Environmental Standard. That means an independent auditor keeps an eye on our environmental objectives and the progress we’re making with our targets.